The Mirenesse Mattfinity Lip Rouge is a matte lip colour that includes Gel-Lite technology and a Lip Hug applicator. It has a mousse-like texture that helps to fill in lines and to make lips look fuller, and thanks to its inbuilt stain it has incredible lasting power too. It also claims not to feather or fade meaning that no lip liner is necessary, and it also contains vitamin E and organic beeswax to help keep lips hydrated. It comes in a range of ten shades that are all named after famous cities from around the world. Each colour has a plush, velvet finish. I received my miniature tube of Mirenesse’s Mattfinity Lip Rouge in my Free Your Mind May Birchbox in the shade Sydney, which is a bright and bold pink-red colour. I said in my May Birchbox post that I was going to write a full-length review, so without further ado, here it is! 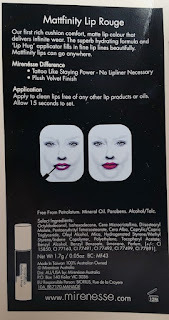 To apply, you need to make sure that your lips are free of any other product or oils. Begin with using the applicator to line the lips and then continue to fill in. Let it set for 15 seconds. 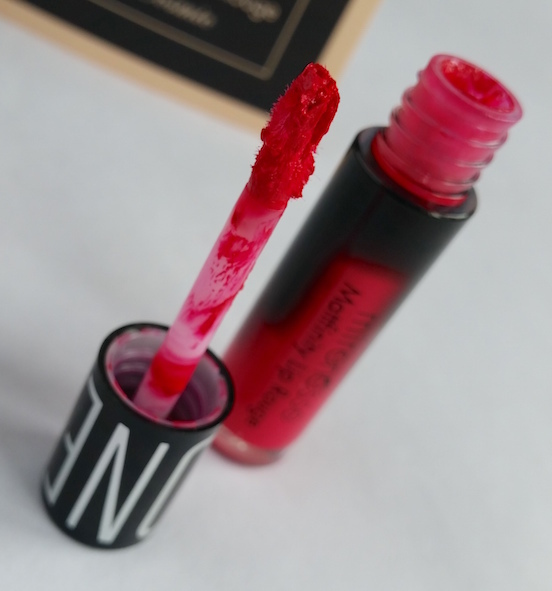 This is an absolutely incredible lip product! Honestly, I want it in every single shade. I tried it on a night out where myself and friends went for dinner followed by a lot of few drinks and it needed only one reapplication, and that was after eating a very messy chocolate fondu. Even still, it was just to top up where I'd rubbed it off as I wiped away the chocolate. It stayed put throughout all of the drinking, so I recommend it totally if you want a long-lasting lip colour for a night out. Application of Mattfinity Lip Rouge is quick and easy. 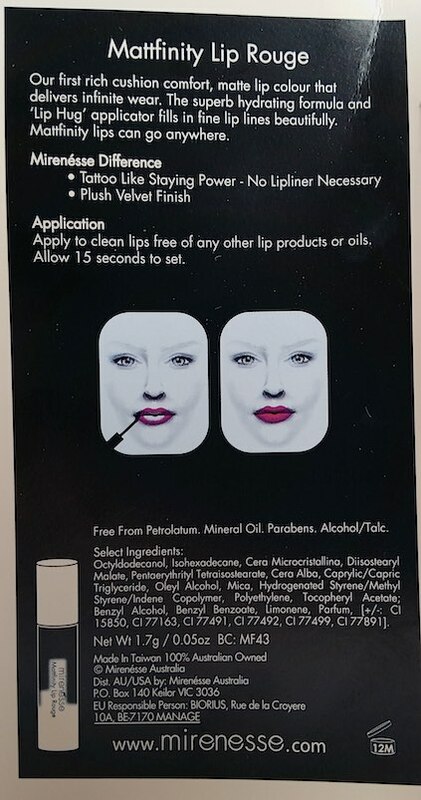 The applicator enables you to line the lips perfectly and the shape of it hugs them for simple filling in that reaches every part of the lips. Not only this, but the colour applies bright and bold from the offset without the need to build it up, so you're ready to go with the perfect lip in no time. Also, it really doesn’t feather, keeping it’s neat line all day/night. I find that even after 15 seconds of setting time, you will still have excess product that needs a little blot. You don't have to blot, but if you don't then there will probably be some transfer, such as onto cups and glasses. After blotting there is close to zero transfer without any reduction in vibrancy or longevity. Most of the shades available are quite similar, but as Mirenesse say, this enables you to create an on-trend ombre lip by using a darker shade as the outline and a lighter colour in the centre. I’ve tried a lot of different lip colours and products over the years, but this is by far one of the best that I’ve given a go. It stays put for a long time, it looks fantastic, the colour payoff is great - what more can you ask for, really? If I could give it a higher level of endorsement then I would, but there aren't enough words invented as of yet to describe how much I love the Mirenesse Mattfinity Lip Rouge. You can purchase a full-size tube of Mirenesse Mattfinity Lip Rouge for £23.97/7g from Mirenesse or £21/7g from Birchbox (but only in shades New York, Sydney and Paris). 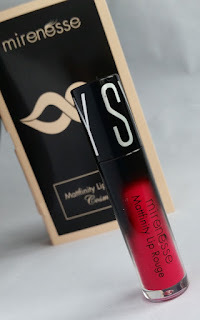 What do you think of Mattfinity Lip Rouge by Mirenesse? What are your favourite shades?